Attitudinal segmentation reveals WHY audiences make the choices they do — which is far more relevant for marketing strategy than demographics or past purchases. Our flagship service, custom attitudinal audience segmentation provides a statistically reliable look at your customers and prospects based on their beliefs, perspectives, hangups, goals and fears. This insight is far more valuable for marketers than knowing their monthly paycheck or which car they drive. Unlike many approaches to segmentation, ours doesn’t predetermine the groups within your target audiences, or give you the same segments that everyone else in your category is using — our segmentation is based on a statistical analysis of custom data gathered from YOUR customers and prospects, finding differences based on how they feel about your category, how comfortable they are in making a choice, and the concerns they have. We start with a blank page, developing a completely custom survey based on the information your team needs to make strategic decisions, determine appropriate marketing tactics, and develop content that grabs prospective customers and doesn’t let go. We can find respondents for you if you’re new to the game or looking for potential buyers you don’t have in your database. When we’re done, you’ll understand your audiences as you never have before. And the segments we develop will help your team and your clients make better decisions and drive engagement with your ideal customers. No more guessing. We’ll give you reliable insight into your client’s segments, their motivations, their demographics and which messages matter most to them. You’ll have everything you need to create compelling, accurate personas, and develop them in a fraction of the time. We’ll tell you which messages work for all segments, which work for specific segments, and which don’t work for anybody. All you’ll need to do is tweak the copy to have content and messaging that hits home with those you most want to engage. Clients want results. Basing your marketing recommendations on statistically reliable insights means your initiatives are more likely to be successful. Successful and effective marketing campaigns make clients love their agencies. 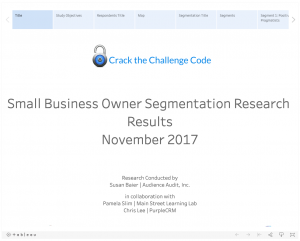 Questions about attitudinal segmentation? Read our FAQs or download our Project Roadmap to see how our segmentation projects happen.